Have you ever thought of impressing your clients in a unique and traditional way? We’re not talking about those electronic cards you send during their birthdays or surprising them with a promo code for their next online shopping spree. What we mean here is going the extra mile in the offline world so that they can feel more special. Sending customers a personalized card, customized wall art they can hang on their office, useful calendars, or even stationery with your company branding are all great ways to wow your customers with a physical item. 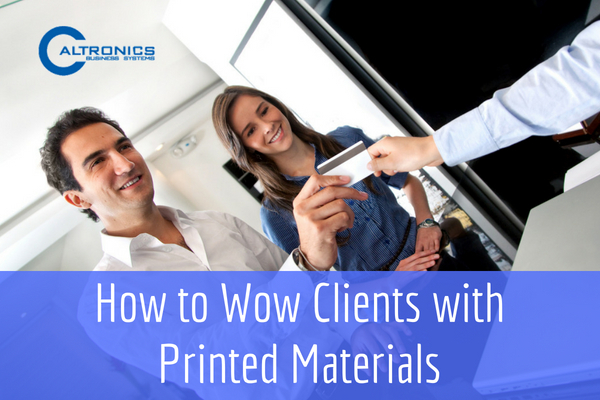 Here are some ideas to help get you started in impressing your clients with your printed materials. Introduce your business using a stunning photo. With so little time to catch your client’s attention, use only one image that is enough to make them stop and look at your printed material. Too many photos clutter the design and confuse the eye so think simple, clean and bold. And remember to use professional shot images whenever possible. If you don’t have updated company photos, use high-quality stock images that speak about your brand. You only have 10 seconds to entice your clients to do business with you. So make the most of those 10 seconds by including only essential information in your printed promotional materials. Don’t forget to incorporate your character branding, tagline and business logo on every business card, flyer, magazine ad and any other marketing printout. This way, you’ll keep your brand on the minds of your customers. With a myriad of beautiful fonts out there, choosing the best one for your print marketing campaign proves challenging. Go for simple yet visually attractive fonts so they don’t steal the main message of the copy. Make sure to pick font sizes that are legible for a wide range of audience ages. The business name and headline should be large and bold. Use bigger font sizes to highlight essential information and smaller ones for the copy’s body. When it comes to colors, contrast is key. There should be a stark contrast between the color of the font and the background of the paper. While it’s always a good idea to work with a wider range of color, just keep in mind that the font color should stand out from the design’s background or the shade of paper you pick. As a rule of thumb, pair light font color with dark background colors and vice versa. Create an impact by giving them gifts with their names (and business name if they own one) in it. It will also be great to include your company’s name in it. So every time they use your gift, they’ll be reminded of how you made them feel valued. Examples of gifts you can personalize are leather pad folio, penholders, diary, travel mugs and tote bags. Great low-budget and simple options include items such as notepads, sticky notes, desk calendars, and wall art – all of which can be branded with your company logo and printed right from your high-quality printer. There’s no better way to get the attention of your clients than by using high-quality printing materials. Take note, you need to be a step ahead of your competitors so use first-rate ink and paper. This will surely make a world of difference. Your packaging should also be aesthetically pleasing. Of course, without a state-of-the-art printer, your well-crafted printed piece becomes useless. If you need advice about the type of printers to use, feel free to contact us. We’d also love to walk you through the printing process so you can understand how this works. This entry was posted in Printables on August 23, 2018 by riehlt. Without a doubt, motivation is a driving force of success for many employees and yet, it doesn’t always come easily or naturally. As a business owner, motivating your people all boils down to knowing where their motivation comes from; it’s about understanding what drives them. 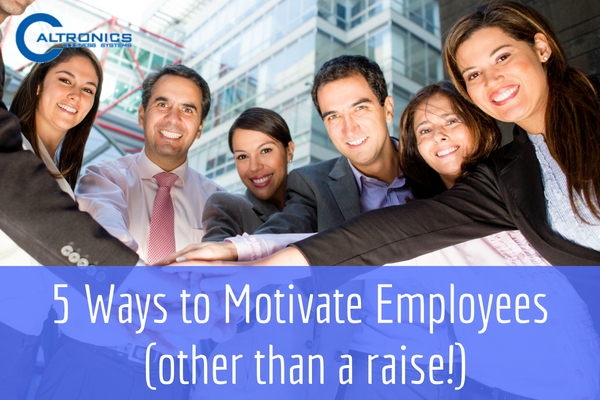 Motivation does not always have to come in the form of salary increase. Some employees are motivated when they do things that they are passionate about while a few others feel motivated when they can make the most of their talents and strengths. For some, motivation is about developing new skills and taking on challenging roles. So how do you motivate your employees at work? We’ve got some ideas for you! Employees feel valued when they know you care about their career and are invested in their long-term success. Encourage them to join workshops and seminars that can help them grow personally and professionally. Invite experts in your industry or in areas they’re interested in to encourage a culture of learning. Give them the chance to develop a new product or service. Employees who are recognized are more loyal, more engaged, and are more likely to stay in the company. Make it a habit to recognize employees for a job well done. Ask them to share any situations where they solved a problem and praise them for their hard work. Show them that you appreciate their work by rewarding them with things they can enjoy, like a free movie pass or gift card for pizza. For bigger achievements, try giving a paid certificate to a professional development class. Besides offering a competitive salary, make sure to create an environment where people are genuinely happy to be working there. Your employees will be happy to come to work when they enjoy what they do. This doesn’t mean giving them free lunches everyday, just offering simple perks like extra vacation days and or work from home once a week can be motivating enough. Try to build a workspace that isn’t monotonous day in and day out. If employees do the same tedious and menial tasks every single day, they will lose focus and eventually get fed up with their role. Likewise, an employee overloaded with responsibilities may struggle with the pressure and experience work fatigue. To avoid these situations, create a balance and variety by delegating tasks efficiently. This doesn’t necessarily mean reducing their workload. What we mean here is that you make them more productive through tools and technologies that can make their lives easier. For example, instead of contracting an external vendor to print important documents, why not purchase a high-quality printer that can do the job. By doing this, your employees can save time and effort that they can reallocate to doing more important tasks. Finally, at the end of the day, be reminded that motivation factors vary from one employee to another. What works in motivating one employee may not necessarily work for another. One of the best things you can do is ask them. This entry was posted in Solution, Uncategorized on August 23, 2018 by riehlt.